Angela Merkel's conservatives have won Germany's election by just three seats, falling far short of a majority and leaving the country in political limbo. Provisional results give the Christian Democrats 35.2% of the vote, or 225 seats, against 34.3% for Chancellor Gerhard Schroeder's Social Democrats. Germany now faces days and possibly weeks of uncertainty which could result in the two parties forming a coalition. Both Mrs Merkel and Mr Schroeder say they have a mandate to be chancellor. 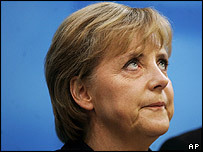 The outcome defies pre-election opinion polls predicting that Mrs Merkel would be the clear winner. She is unlikely to be able to form her preferred coalition and may have to join with the Mr Schroeder's centre-left SPD in a "grand coalition". The BBC's William Horsley in Berlin says such a coalition could lead to instability or gridlock as the two sides differ sharply over how to raise Germany's economic spirits. Investors' dismay was reflected in the markets on Monday, with Frankfurt's benchmark Dax index losing 2% in early trading, and the euro hitting a month low against the US dollar. "We would naturally have wanted a better result," Mrs Merkel said, but she insisted she was still on course to become the country's first woman chancellor. Mr Schroeder has refused to admit defeat, raising his hands like a champion amid joyful scenes among his supporters. "I do not understand how the [Christian Democratic] Union, which started off so confidently and arrogantly, takes a claim to political leadership from a disastrous election result," he said. He said he could envisage a grand coalition, but only if he was its leader. The CDU's intended coalition partner, the pro-business Free Democrats (FDP), did well with 9.8%, giving them 61 seats. But that is not enough to secure a joint majority. German political experts are poring over a host of other possible coalitions. 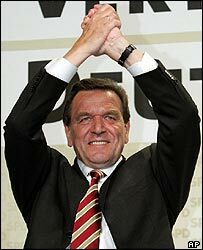 The Left party, newly formed from disenchanted SPD members and former communists, took 8.7% (54 seats), and the Greens, Mr Schroeder's coalition partner, won 8.1% (51 seats). Results from a final seat in the city of Dresden will be decided on 2 October, although that will not tip the balance of power. Voting was delayed there because of the death of a candidate. There is speculation about a possible "traffic light" coalition - never tried before - between the SPD, Greens and the FDP. FDP leader Guido Westerwelle ruled that out on Sunday, but he could face pressure to reconsider. Meanwhile, a new left-wing coalition of the SPD, Greens and Left party looks unlikely, commentators say. A coalition deal must be reached before 18 October, the deadline for the new parliament to sit and choose a new chancellor. If there is no deal, the only way out would be a fresh election. As the results came in, the mood among Mrs Merkel's supporters was subdued. The CDU fell back from a 20-point lead in opinion polls when Mr Schroeder called an early election about six weeks ago. Although opinion polls on the eve of voting gave her party more than 40% of the vote, they also said as many as a quarter of voters were undecided. With sluggish growth and unemployment remaining above 11%, both main parties agree that Germany needs reforms, but they disagree over how to approach them. Mr Schroeder says the labour and welfare changes he has set in motion during his seven years in office are starting to work, and he argues that Mrs Merkel's proposals on tax and labour reform go too far. Will the German coalition work?